When the Swiss clarinetist and composer Jürg Frey was celebrated as Composer in Residence at the 2015 Huddersfield Contemporary Music Festival, pianist Philip Thomas wrote of him, "Jürg Frey the composer is inseparable from Jürg Frey the composer. To understand his music is to know that underlying each event, each phrase, each rest, each relationship, is the beating heart of a performing musician." If Thomas needed to cite musical evidence in support of those words, an ideal choice would be the current album of Thomas's own renditions of six Frey compositions. The compositionsranging from 1992's brief "In Memoriam Cornelius Cardew" to "Extended Circular Music No. 9" from 2014/2015paint a coherent, integrated picture of Frey the composer. That is even truer when the current album is considered in conjunction with the Another Timbre 2015 double CD of Frey compositions, Grizzana and Other Pieces 2009-2014, played by a seven-member ensemble that included both Frey and Thomas. 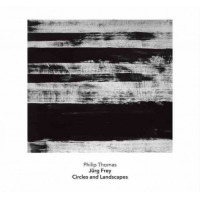 The success of Circles and Landscapes owes as much to Thomas as to Frey's compositions, with Simon Reynell's warm, intimate recording capturing every nuance of the pianist's performancesvital, given the importance of the relative volumes of the notes, the spaces in between them and their decay-times. Thomas manages to get all those just rightin fact, so right that it is difficult to imagine his renditions of the pieces being bettered by himself or anyone else. For example, lasting nearly half-an-hour, the centrepiece of the album is a version of "Pianist, Alone (2)" which, true to its title, makes the pianist sound very exposed. Any slight glitch of timing or pedalling would be all too obvious, but Thomas delivers a flawless performance so such matters become irrelevant, leaving the listener to savour the spare beauty of the composition in Thomas's hands. Throughout the album, that symbiosis of composer and performer is repeated time and again. Having begun with a Thomas quote, let's end with one from Frey himself. In a 2015 interview on the Another Timbre website , he made the following significant comments, "In my work, I consider each note as an individual, I respect each note as a sound personality. This may also be one of the reasons why I continue to compose by hand: I can give my attention to every note. I take responsibility for the note, and I also want that every note itself feels good and right in its place and in the context." No further comment is necessary... Frey's loving care and attention to detail shine through in his work. Simply exquisite. Track Listing: In Memoriam Cornelius Cardew (1993); Circular Music No. 5 (2011/2012); Extended Circular Music No. 2 (2014); Pianist, Alone (2) (2010/2012); Miniature in Five Parts (2014); Extended Circular Music No. 9 (2014/2015).